craftytammie: Silly Mama Quilts giveaway! My friend Brooke is offering a $20 credit to her etsy shop, Silly Mama Quilts. 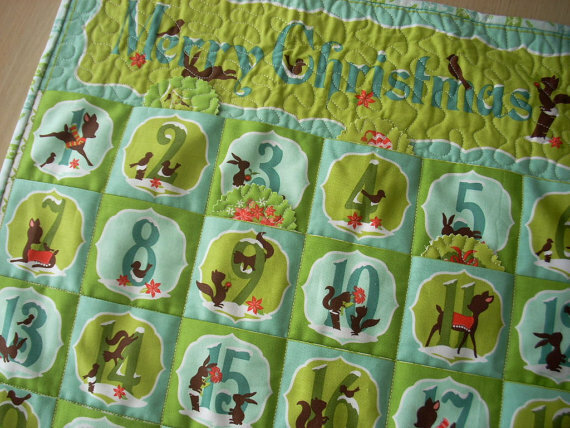 New to her shop this season is this Alpine Wonderland advent calendar - so fun! She makes really cool table runners, mug rugs, pillows, quilts - seriously, anything!! and she also offers FREE SHIPPING! for us fabric junkies, check out her fabric section for great destash deals! Giveaway ends noon CST 11/19/2012. Winner will be notified by email and have one week to claim prize. Thanks so much to Silly Mama Quilts for sponsoring this giveaway! Brooke will be back later this week with a guest post, so be sure to stop back by! I like the Lucky Penny Snack Mat. I would choose fabrics from your "de stash" sale. The batiks and the pinks are my favorites! Thanks for sponsoring a giveaway. I would buy some of her destash fabrics -- the kumari garden bundle looks really lovely. I love her quilted stocking, if I won I would get that. I'd choose some of Brooke's destash fabrics! I just love her shop...I was really taken by the variety of snack mats...I'd probably buy several of these! I would get some of her destash fabric! Such pretty items in her shop! I would buy one of her mug rugs. There's lots of cute stuff to choose from! I would either get a mug rug or a placemat. I would buy a mug rug. I might buy some of her destash fabrics or some snack mats. Very cute items - thanks for the chance to win! I would love to get my hands on those winter batiks. You have some great stuff available. I might pick up the Kumari Garden destash...or I might change my mind and go for some of that Alpine Wonderland goodness! I would use it towards the purchase of the Joy,Joy Tablerunner to use for my Christmas Family Dinner. Unless I decide to buy material to make something myself. I'd buy mug and or snack rugs - so cute! I would buy from the destash sale. I just love others destash sales. Thank you. I do so love all of the other things in the shop alos. I would buy from the destash fabric, or the advent calendar - can't decide! I would buy a couple of the mug rugs. So pretty. I would buy fabric!!! I love the selection she has!